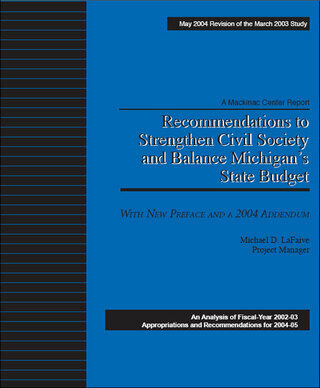 The community college budget for fiscal year 2004 is comprised of two types of appropriations: those for the day-to-day operations of Michigan’s community colleges, and grants, of which there are two. Substantial and immediate savings could be realized with respect to the day-to-day operations by retroactively indexing spending to two factors: inflation and enrollment, beginning in fiscal year 1985. Community college spending has grown at a far faster rate than either factor — a development that calls for greater scrutiny of requests for state funding increases. One of the two grants, known as the "At-Risk Student Success Program," should be eliminated. It financially rewards community colleges for labeling students "at-risk," duplicates other funding mechanisms for special-needs students, and increases the overall cost of funding community colleges.